I have a Samba server with CUPS. It is configured to act as a print server on my local network. Works fine with Windows PCs needing to print. I have also installed the Google cloud print connector in order to allow Android devices to print too. I wanted to share how I made the cloud printer show up on the Android devices. You configure the connector using the config file. 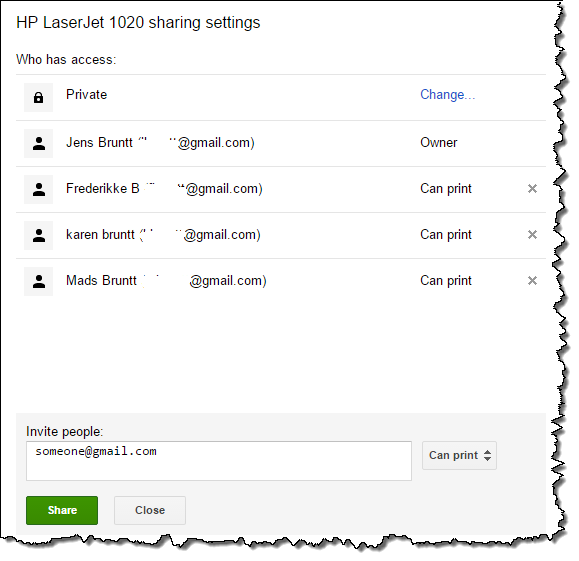 Then you go to the Google Cloud Print website, and find your printer, click the printer, click "share" and here you add the Gmail addresses for the users you want to be able to use the printer. Note: they are "invited", they all need to actively do something to be able to use the printer. Go to settings, look for printing, tap cloudprint, tap the menu-button, select add printer. Here you should see an invitation to use your cloud printer. Tap appropriate buttons. To test open up Google Chrome on the device and tap menu and print. Your cloud printer should show up as available in the list of print options. Select it and print. Her er lidt fotos fra Mads' konfirmation.